My girls both want to be mermaids for Halloween this year, so I went to the costume shop... and the mermaid tails were like, $30 a piece, for little scraps of fabric in the general shape of a tail. Sickening. So what did I do? I high-tailed it out of there (har har) and hit up the nearest fabric store. "Okay, kids. Pick out two fabrics each," I said once we were in the fancy party dress section of the fabric shop. The glittery sequin fabric instantly caught 4 year old Gracie and 2 year old Annelie's eye. Go figure. Then, they each picked out a glitter-infused organza (for the fins). Total cost of fabric for TWO mermaid tails? $12. Can't beat that. 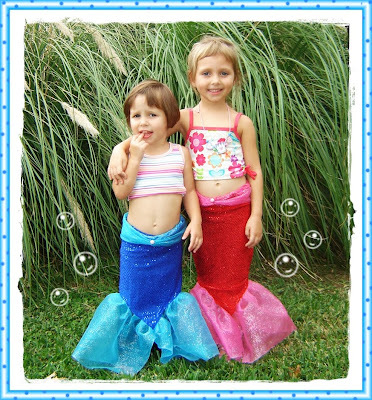 Want to make mermaid tails of your own? Here's how! *NOTE: my kids are preschool/toddler age. Gracie, the oldest, is about the size of an average 4 year old. If you have older kids, you may need more fabric! **Also, Halloween gets a bit cold, so they are both wearing long cotton pants under their tails. Definitely give yourself enough room when you are measuring the fabric, to fit pants under their tails, if you need to! Okay, first things first... This tutorial might look a bit daunting, because I took about a million and ten photos, but really, it is super easy. I tried to be as thorough as I could, so don't be dismayed by the photos! If you are confused at all, please leave questions in the comments section! 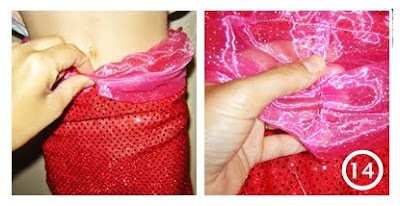 Wrap sequined fabric around your kiddo's waist, making sure the tail is as long as you can get it. Cut, so that when you sew, you have a straight tube of fabric. Make sure you give them room to walk! Make sure you have plenty of room to roll over the waist, to fit in the elastic. This is your last step, so give yourself plenty of room, now! If your tail isn't long enough - reaching her ankles - you can use the extra sequin fabric to lengthen it. My sequin scraps weren't wide enough, so I tapered the bottom of the tail a little (my red tail), and then sewed the strip of sequin fabric to that. Try it on your kids! If they will be wearing pants under their tails, make sure there is enough room! 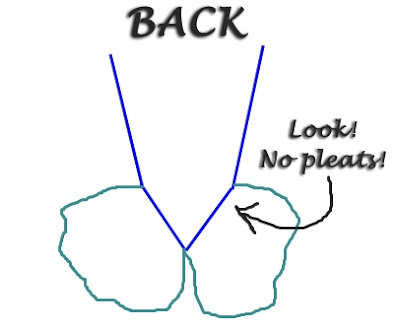 Once the tails are on your kiddo, cut the bottom into a V, so that the bottom point of the V is just above the ankles. Time for the tail fins! Pin one organza strip to one side of the front, with pleats so that as you sew, you get a lovely ruffle. You will only be pleating the FRONT of the tail, and sewing the back flat - it looks fantastic this way, but if you want to pleat both front and back of the fins, you may need more organza. NOTE: Make sure you leave about 2 inches at the tip... you will be rounding that off with scissors once it is sewn on. Sew! Don't worry about the back of the tail at this point... just get the front sewn. Round off the bottom of the V. Don't worry about making this perfect. The fin will be so full and fluffy that imperfections will be hidden. Use Fray-stopping solution everywhere you cut the organza and let dry completely before moving on. Sew the back - just fold the remaining ends of the organza over to the back of the tail, pin in place and sew straight. You should have just enough to give yourself about 2 inches off the end, which you'll round off and Fray-check. Then, make sure all the organza is cleanly cut, and all ends have been touched with the no-fray solution. Yay, bottom done! Time for the waist! Measure elastic and sew in a hoop. Make sure it is nice and tight and won't pull apart! 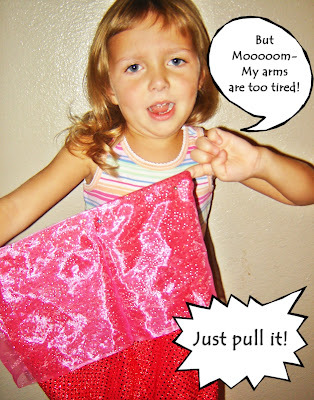 Stick the tail on your kiddo, and then take the left over organza strip and wrap it around her waist. The organza doesn't stretch, so give yourself a bit of room for stretchiness when you cut. Then, sew the organza into a tube and fit it over the un-sewn waist of the tail. Step 13: Put your worker-monkey to work! Fold over the top of the tail (the sequin fabric and organza together). Slip in the circle of elastic. Have your worker-monkey (er... I mean kid) pull the elastic tight, and pin the folds over, so you can sew the elastic in. Okay, okay, I know this isn't traditionally the way people put elastic in a skirt. You're thinking, OMG, Marisa what are you doing??... why didn't we just put the elastic in during the first step, using a safety pin, like a normal person, and then sew closed? But let me tell ya... when I made this skirt, I was designing as I went (aka totally winging it), and I didn't know how much organza I'd have left for this part. Since I KNEW that this step was going to be easier than it looks on paper... er, computer screen... I left it for last. Have no fear, people! Sewing the circle of elastic in this way isn't hard at all. See? Totally easy. And you are just about finished now. 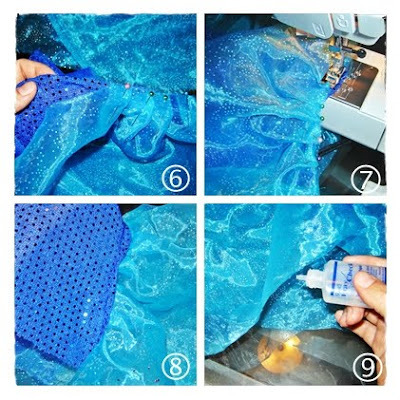 Pinch the organza around the center on the front and sew. You can add a bead to the center, if you like, to give the tail a bit of pearly bling! Repeat for the back. And VOILA! You are done. 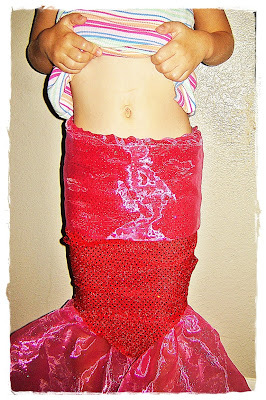 Now just grab your littlest mermaid and try on her tail. When I see this picture, I can't help thinking, "Her name was Lola, she was a show girl..."
Seriousy, wasn't that easy? And affordable? And ridiculously adorable? Great job Marisa! I think the best part about these are that there's no way they can run away quickly. At the Copa... Copa Cabanna!!! Go on, get your Barry Manilow on! Those are too cute for words! So cute! My littlest wanted to be a mermaid...then Max from Where the Wild Things Are...and now an Oompa Loompa. After seeing your tutorial, maybe I can convince her to be a mermaid again! Your girls look adorable! That is a great blog post. What a wonderful costume! You have adorable little mermaids! Thanks for sharing your creativeness! Love the tails!! What a creative mom you are! You make me wish for a little girl. I'd sew up a mermaid tail tonight for her if I had one. Hmmm. Maybe I can convince my boys to be mermen for Halloween? Nah. They'd never go for it. You are so talented. What lucky girls they are to have a mum like you. They look lovely, you have made them proud and your daughters so cute! Thank you so much for posting this tutorial! AND for all the photos! My daughter is going to LOVE her very own mermaid tail!! OMG what cute little mermaids! And such a creative sewing project!! do you know what i could search for to find the sequin-y fabric? i only have walmart for a craft store :P in my town, so my options are very limited. i am trying to look the fabric up online so i can order it and get it made by halloween, but i can't find it. I'm not sure if that site will work for you, but at least you can see the product description and name, so you can find it quickly! Good luck! Oh yikes... that Tulle Direct site is for wholesale... let me see if I can find something better to order from, but you can at least see what type of fabric it is from that link. thank you so much for all your help searching for me! i'm letting my almost 4 year old decide which color now--pink or purple. of course. :) i'm still a novice at this sewing thing, so i want to have plenty of time to work on this. and thanks so much for the tutorial! my daughter has been telling me she wants to be a mermaid for the past several weeks, but i didn't want to do the disney thing. this will be perfect! Mel, just a tip if you are new(ish) to sewing... that stretchy 3mm dot fabric is a pain to sew. You might want to consider sewing in a cotton lining, which will keep your sewing needle from catching on the fabric, if it is on top while you are sewing. Sewing the organza to the polyester dot fabric was easy, as long as the organza was on top. Mel- Oh good! I'm sure your mom told you, but I'll say it if she didn't... make sure you add a little more fabric to the lining, if you are using a solid cotton, rather than a knit, as the dot sequin fabric is stretchy. You want to make sure your little gal has plenty of room to walk! The girls look adorable - can't believe you not only had the energy to make the tails but also to photograph the process and write a tutorial explaining how! Supermum! LOVE this! Too late for Halloween as I'm in the throes of the first princess costume but I think the dress up box needs one of these! Thanks! I'm headed out tomorrow to get Ariel material. This is sooo much better than the store bought version. Well, dah. If all patterns were written as well as yours, I would sew more! thanks for sharing. Thanks for sharing!!! My daughter loves them! It's times like these that I wish we had a daughter! This is really fantastic;from a year or more my doughter wants a mermaid costume.I am going to make it finally,thanks soo much. Lovely costumes. I made a mermaid costume two years ago with similar fabric, but I used a pattern. it was a disaster! Mine is not so nice because I haven't bought organza. BELLISIMO DISFRAZ DE SIRENA!!!!!!!!!!! !TE FELICITO!!!! !.MUY BUEN GUSTO.ME ENCANTO. Thanks for the directions! My girls have been wanting a tail for sew long! :) I wish I was a better sewer. Thanks for the excellent description! I got my daughters request just before dinner and by the time she went to bed I only had the organza at the lining left. And I'm NOT used to sewing! I cheated a bit though: I re-used a rib-knitted tshirt for the strechy part and could keep the neck, which meant I didn't have to sew a lining or elastic at all. I just cut if off by the shoulders and sew the sides. The skirt then became a little lower cut in the front, showing the belly-button of my girl, while it went a little higher in the back. YAY! So glad this tutorial is working out for all of you!! And those of you who are emailing me photos of your creations, THANK YOU!! I love seeing them!! Ok so I am on try number 2... (still teaching myself everything about sewing) yea... I should measure twice not cut twice... Anyways... Is there any way you have an up close pictures of the elastic putting in part? Shannon - Oh noes! Sorry you have to try it twice! Hopefully attempt #2 will work out for you! As for the elastic, no, I don't have other pictures (sorry, I deleted them after this post). However, all I did was sew the elastic into a circle, then sew it into the waist (which is already circular, because it was sewn into a tube in the first step). If that doesn't make sense, please email me at elegantsnobbery@hotmail.com and I can draw a diagram and hopefully make more sense of it for you! And if you have a way to slip in the elastic that will be easier for you, of course go ahead! Well I am trying again after bed time tonight... I am thinking of just doing it the old fashion way and then making the waist a belt style organza tie... Hmmm... so no doubt mine will look different but it will rock either way to my 2 year old. I will def link you to my blog after I post pictures!!! Drum roll please... I did it!!! I made it!!! It is great!!! I still need to tie up some lose ends but have a look! Shannon - ABSOLUTELY adorable!! Love it in that green color!! I tried to comment on your post, but for some reason it wasn't working, but Woo hooo! So glad you and your daughter love your tail! I just wanted to tell you how much I loved your tutorial. I used it to turn my little girl into a mermaid for Halloween. You can see pictures here if you'd like. I'm making 9 (yes, 9) of these tails for my niece's 4th birthday party in two weeks and I had a question. Her mom hates the sequin stuff because it doesn't come in pale colors and won't match the theme (ugh), but we found a different fabric that also stretches (slightly) that is kind of shimmery and smooth feeling. The problem is that the stretch is only one way and runs the opposite way of what we had cut. Does that make sense? I'm worried that I won't have enough fabric. Is the stretchiness running horizontally that important? Thanks! Tiffany - the stretchiness is only important if the fabric needs to be stretchy in order for the kids to walk. If you make them loose enough that there is room for comfortable walking, I shouldn't imagine a non-stretchy fabric being a problem for you. Hopefully that answers your question!! If not, be sure to let me know! And good luck! I'd love to see pictures if you'd like to share! And everyone else who has made a tail or tails, and has let me know... thank you so much! I love knowing you have happy little mermaids out there, and I love seeing your photos!! I cant wait to try this! My daughter wants to have a mermaid birthday party and this will be perfect for her! I found this tutorial on pinterest a few weeks ago, bought all the materials last weekend and made my daughter's Ariel costume today. LOVE it, Joanna! That jewel and the clam shell top are perfect!! I just used your tutorial to make one for my three year old and one year old and they couldn't be cuter, thanks for sharing! Yay, I'm so glad you guys are loving this tutorial! Thank you for the great tutorial...I was terrified of having to make a tail. And this made it so much easier and fun! Here is a link to my finished blue mermaid costume that I did for my daughter this year. We used shells collected over the summer to make a mermaid necklace & crown. My daughter always wants to dress up like a mermaids and I am in the process of making her one of these adorable tails but I am stuck. I don't understand how to pin and sew the tail part on. Do I pin the organza on the front of the sequin fabric or on the back? Carrie - Pin it so the rough edge is on the inside. :) Hope it works for you!! thanks Marisa for the great inspiration my daughter Anneli (!) who is 3.5 wants to be a mermaid and I was missing the inspiration for the skirt! best from Anneli's mom to Annelie's mom! Hi there, I hope you still read the comments on this post. I am so glad I found it, it's clearly the best tutorial out there. I am not a great seamstress, so just one small question - does it need to be organza for the fins? I am asking because I found some lovely shimmery slightly stretchy fabric, but it's obviously much less fluffy than organza because it's heavier, if you see what I mean. Thanks so much for your help! Yes, I do check my messages! Thanks for asking. I think that it won't matter, just expect a different look. Once you get the fabric pinned, before sewing, you'll see what it should look like when it's done. With a heavier, stretchier fabric, you probably won't have the flared fins, but if it's cute, I say go for it! I'd love to see pictures of how it turns out, when you're done! Thanks so much for your tutorial! My 4yo has been obsessed with mermaids lately, and not being a seamstress, no way was I paying $15+ for JUST a pattern, much less that fabric and supplies! I used your tutorial as a guideline and went from there. My little girl loves it! Again, thank you! Your help made my little girl very happy! Love, love, love, love, love... Thank you for inspiring me to create some fin-tastic party favors for my daughter's upcoming birthday party. Thank you so much for posting this online! I am just finishing up this skirt for my daughter's Mermaid birthday party this weekend! I am not very good at sewing...but it wasn't that hard and turned out amazing! Thank you!!! Thanks for a great idea and instructions! I consulted your blog during the construction of 8 mermaid tails as party favors for my daughter's 7th birthday party. All the tails were very much loved and turned out great (especially considering my sewing abilities!). Fun project!! Thank you, Marisa. Really helpful and soooo cute!! My daughter looks great, and I enjoyed the project. 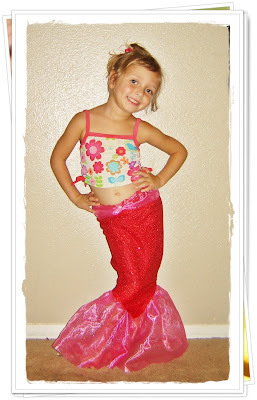 Thank you for sharing your clever, easy mermaid tails! I am costuming Disney's Little Mermaid Jr for local theater and this is by far the cutest, simplistic pattern/idea I have seen yet! I will have to share resulting pictures, show is in November. :) So glad you love this tutorial! And so glad so many people find it just as easy to make as I did! Just found your tutorial... I have some leftover tissue lame, do you think I could substitute that for the organza? Thanks for the tutorial, my daughter is soooooo excited! Hey I just made this mermaid tail! But I have one question(and I k ow its been a couple years) but I can't seem to get my organization tail big and fluffly. I did the pleates. I did them about 1 inch big and sewed the fabric about 1/2 in from the bottom of the "tail " any advice? Laura - It will have a different look, probably, but as long as you can sew it to the sequin, I'm sure it will be cute! Anonymous - Hmmmm... I don't know why they're not working. If you want to send me an email with pictures, maybe I can see what's going on. Or your can pick up some extra organza, if you need it, and pleat the back part of the tail, as well as the front. Thanks for this tutorial!!! It's so funny how you described making it b/c it makes perfect sense to my self-taught-seamstress' brain! I have to google all the technical terms when watching/reading a tutorial! Thanks, C :) glad this tutorial works for you! Marisa, I'm having a brain lapse or something! When pinning the tail, is it right sides together? I finished a mermaid tail for my daughter! Thanks for the tutorial. I made some changes, most importantly, I used different fabrics that didn't fray. That made it so much easier. Cute pictures, Susie! Thanks for sharing :) I will definitely check out the no-fray fabrics... and your comment kick-started some ideas for more tails. :D yay! I know this is a super old post (I'm not a spammer, I promise! ), but this is just what I was looking for!! My daughter wants to be Ariel this year. I'm featuring your tutorial on my blog tomorrow, if that's ok. Thank you so much!! This is such nice little mermaid costumes for girls! I totally love it. Lovely of you to share this one. Erin - so sorry your machine is getting messed up!! That hasn't happened to me, but maybe someone else will chime in with some help. I've never tried it, but it might help! Thank you for these intructions. I just looked online to buy a mermaid costume and couldn't find one that I liked and I didn't want to pay 30 bucks for one. Your idea looks doable and so cute. Thanks! Thank you so much for this tutorial! I just finished my daughters costume using your tutorial. I love how it's super clear, lots of pictures and I found it very easy to understand. Thanks for posting this tutorial. I just finished my daughter's mermaid costume. Your directions were super easy to follow! Thanks for posting. Happy Halloween!! 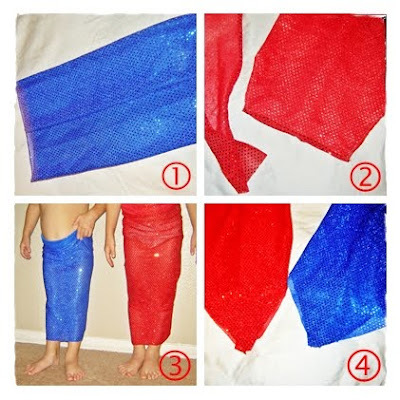 Linda - I bought a 1/2 yard of the the material for the tail fin when I made this for my kids as preschooler/toddlers. The picture I have between Step 4 and Step 5 show how to cut the tail fabric if you have the fabric store cut you a 1/2 yard piece. Idk what the exact dimensions for that would be but it might be on Google. fantastic - just bought the fabric, on holiday next weekend but if my little one keeps her promises to sleep properly on holiday then by the following weekend she will be a little mermaid! These sparkly mermaid costumes are too cute! Thanks so much for breaking it out, step-by-step. I thought I'd mention that there is a Creative Costume Contest over at http://www.halloweenhero.com/costume-contest-2013.html and the Grand Prize is $250. Just thought you and your readers may be interested in entering. Keep the great tutorials coming! Wow. your directions saved my life! I doubled up on the organza for a really full tail and what a hit! I cannot get the costume off of my little mermaid. Thanks so much for your creativity. My daughter is so very excited about having a mermaid tail that looks like this!!! In my head, I was busily over-designing a cutaway-wrap-skirt-ruffled-side-tie... ugh. Instead, I will deconstruct a purple stretchy skirt that I bought THIRTEEN years ago and add some of the gorgeous plum organza that has been hiding in my fabric box. THANK YOUUUUUU! p.s. The "JUST PULL IT!" picture keeps making me snort. I may be in love with you. I am sad to say that I don't own a sewing machine. 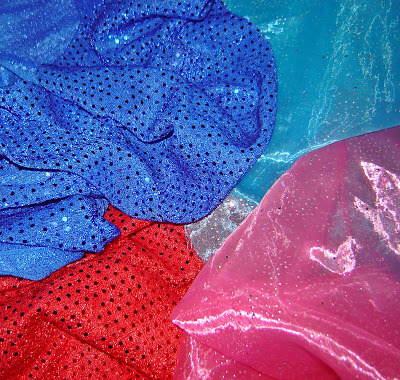 I have yards of fabric ready to be used for daughter's mermaid tail. 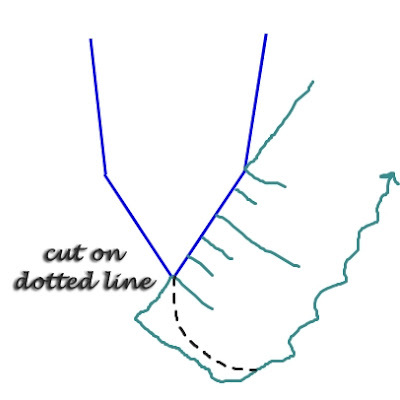 Is this possible to hand stitch or too tedious to sew by hand?? My daughter has her heart set on being a mermaid for Halloween tomorrow! Anonymous - I think it might be too tedious to hand stitch (but I'm also a bit too lazy for that) HOWEVER I bet you could hot glue it! Last year, I was pressed for time, so I hot glued our Halloween costumes - quick and easy :) Good luck! I want to give a huge THANK YOU! to those of you who have not only made this tail, and let me know you liked it, but also to those of you who have emailed me photos - My girls and I LOVE seeing your little mermaids! Sure, I think the glued pleats should work! At least they look fabulous in my head as I imagine them, haha. I would probably pin it all together, just like if you were sewing, with the whole thing turned inside out and the pleats pinned to the tail fabric - then glue, keeping your lines as straight as possible. When you turn it the right way, all the glue should be hidden on the inside. Thanks for the great tutorial! I'm a novice on the sewing machine, and these instructions totally helped me make a cute Little Mermaid tail for my 2-year-old's Halloween costume! Adrianne - GORGEOUS!!! I want that tail for myself!!! I'm so glad, years after posting this tutorial, I'm still getting awesome emails with photos of little ladies in rad tails - so fun to see! Marisa, you are a legend! My almost 6 yr old has been begging for a mermaid tail for her party and this pattern is every bit as gorgeous, affordable and easy as you say. thank you so much! i couldn't justify spending $40 on a mermaid costume and my home made one turned out beautifully thanks to this blog!! Hi Marisa! Question for you--I am trying to make this costume and am a new sewer :) My organza is 1/2 yard wide but 30 inches long. In order to make the fin gathered in the front and sewn straight in the back in one continuous piece, I need to use the full 30 inches it seems? But when I cut the organza like you showed on your diagram 1 long piece for the waist and two shorter pieces for the tails--I have one continuous piece for the tail and the other side is 2 equal pieces. Is this how you did this? I am SURE this is a very novice question--haha...Thanks!! The captions on the "tired arms" photo are spot on. I'm going to try this for my daughter's pool party. I just had a request from my cousin to make her granddaughter a mermaid costume for her 1st birthday party. This is exactly what I had in my head to make for her! Thanks so much for the post and your detailed instructions. Wish me luck! 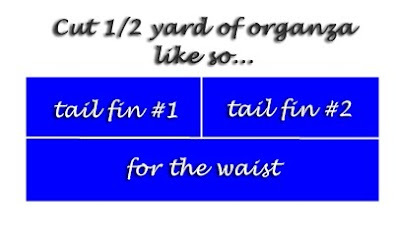 Did you fold over the fabric for the tail fin and waist band and cut or was it one long piece? So glad to have found this! My daughter wants to be a mermaid for Halloween and I have been looking for a tail that I could make. I have some pink sparkly tulle and I was wondering if you thought that would work in place of the organza. I have never used the tulle instead of organza, because I'm terrible when it comes to catching it on my needles and making a huge disaster out of my project, but I don't see why it wouldn't be fine - I've heard that if you use tissue paper things won't slip or catch... but don't quote me on that. I'd google sewing with tulle tips, if you're unsure :) Good luck! Hope your mermaids love their tails! super idée, grace à vous, il y aura une petite sirène à capesterre de marie galante pour le carnaval. thank you. Excellent pattern and instructions, Marisa! Thank you! Instead of the anti fray product, I got a lighter and singed the fraying hem. Worked a treat!! Thank you for the tutorial! I just made one for my daughter. She loves it! Thank you so much for sharing this.. I looked at so many DIY for mermaid tails and they're either too complicated (for someone with no sewing experience) or all done with glue and too cheap and ugly looking lol. This was PERFECT! I didn't follow exactly but I used it as a guide to make my daughter's tail. Definitely a huge help! I seriously wish I could send you a picture! :) Thanks again! Hi I'm just a little unclear about the last step at the waist After you sew the elastic to the tube was it and organza are you folding the organza in half lengthwise and attaching all the way around the 'tube' waist again? Or are you just leaving loose the the second long raw edge? Step 14 ,I think? Tracy, my organza had a finished edge and so I left it loose on that side, and just bunched it up and pinned. If your edges are raw and you have enough fabric to fold over and sew, I recommend bc the organza frays easily. I hope that answered your question!! Marisa, Thanks for your help. Little projects take me forever. The devil for me I stress the details. How do I decide the main shape for my granddaughters mermaid flipper? She has a 20 1/2 waist hips are 24 and not to mention leg room would be much narrower. So it's hard fro me to deicide which width to use if i'm just 'making a tube" ? She's not here with me to model on. If she was she couldn't stand still long enough. LOL tried that yesterday. Advice is appreciated. Hi there! I just found this and am so so excited! All three of my girls (6, 4, 2) want to be mermaids for Halloween this year and your tutorial looks like my winner! I just had one question for you. 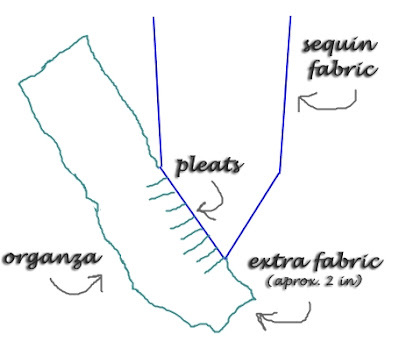 When you sew the organza fins onto the stretchy tail fabric, how to you lay it out? Do you sew wrong sides together? Do you just sew the organza behind the stretchy? Please help me out here. I have some experience, but not too much. This mermaid tail is perfect. Thanks again!